Whether you’re in town for business or leisure, you look forward to finding comfortable accommodations. Hotel amenities should be thoughtful and plentiful. We know traveling, working and exploring can be tiring. 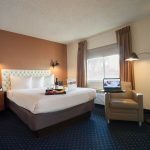 At Hotel Focus SFO we want to provide you with the little-something-extra to make your stay easy, restful and an overall pleasant experience. All of our guest rooms are equipped with the following amenities, plus a little touch of grace and elegance. Have a look below at what Hotel Focus SFO has to offer you and contact us if you have any questions. Effortlessly stream content from your mobile devices to your in-room TV using an advanced connectivity panel found in every guest room at Hotel Focus SFO. Courtyard with spectacular Desert Bloom Landscaping as well as two fire pits and Nantucket style chairs and tables.